Milan. It wasn’t on our bucket list and wasn’t somewhere that we were dying to visit, but when a friend happened to be visiting Europe and that was the closest place we could visit them at, we thought why not! Even though we had just arrived back from Cinque Terre on the Monday, there isn’t going to be much longer that we can say ‘let’s just pop to Milan for the weekend’ so we quickly booked our tickets. Ryan Air flies to Milan fairly cheaply from Frankfurt Hahn, our tickets happened to be less than $80 each, return, and the flight was short at only an hour long. 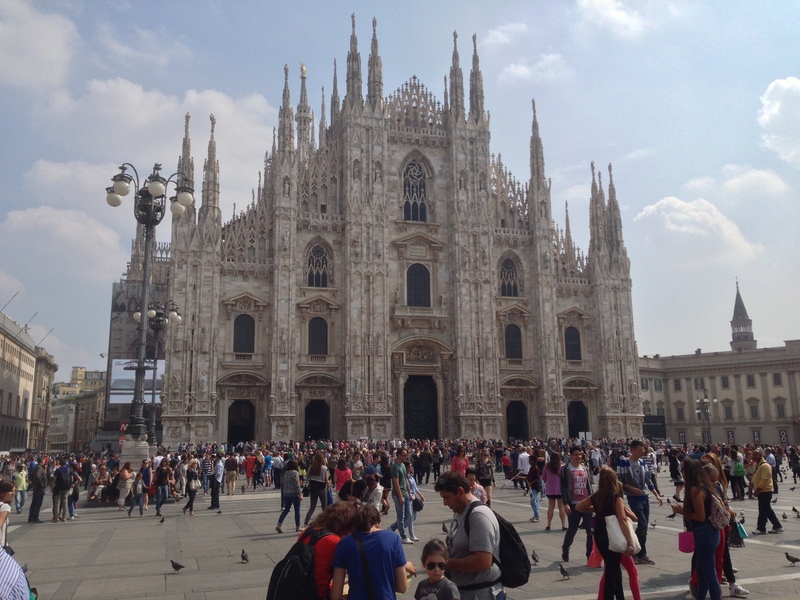 We were able to both work a full day at work and drive to the airport on Friday night and arrived in Milan before 9pm. A lot of our flight were celebrating ‘TGIF’ by the amount of prosecco and beer that was flowing from the drinks cart! To avoid any unnecessary stress, we stayed Friday night at Milan Bergamo airport at the NH Hotel across the street so that we didn’t have to navigate a foreign city in the dark – or deal with transport into the city at that hour. The hotel was awesome and for once a king size bed was truly a king size bed in Europe. Hotels were definitely cheaper out by the airport, so I would recommend staying in the area if you arrive at Bergamo airport late at night. The next morning we woke and wandered the huge mall next to the hotel to find some breakfast. The mall was impressive with over 250 stores, including MAC and Sephora! This brought a massive amount of excitement to this lady, and much fear to Nick. We quickly left the mall so we (read: I) didn’t empty the bank account and so that we didn’t spend all day there. The bus left from the airport and cost €5 each for over an hour ride, which seemed really reasonable. It dropped us off at the Milan Central station which made getting onto the subway easy. Unfortunately the metro system in Milan seemed pretty seedy. 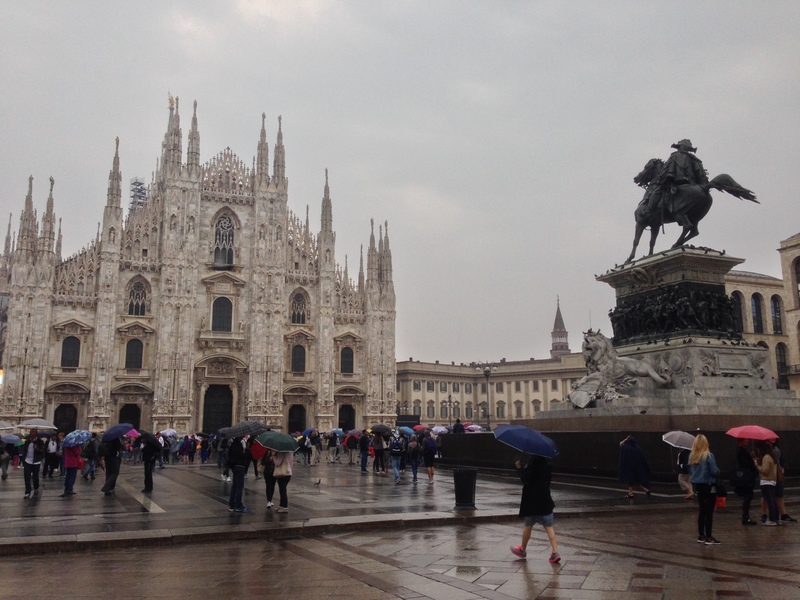 In fact, a lot of Milan seemed seedy. When I imagined Milan in my head, I thought it would be a really classy city due to it being what I thought was the fashion capital of the world. It actually was quite dodgy feeling and not somewhere that we really enjoyed being. We were ripped off at the metro station by a guy who tried to steal our change from the machine, I tried to get rid of him from lingering around us as I thought he was going to try and pick pocket us but instead he swapped our change in his hand for smaller change – quite the magician! Big picture, it wasn’t a big deal at all, hardly worth getting upset about, but it just seemed to be a bad introduction to the city. The metro took us into the city and we then walked to our airbnb apartment which was a little bit of a disappointment. I don’t think we will be staying airbnb again in a foreign place where we don’t know the areas very well. But, it was only for one night and it was somewhere to simply rest our head, so we made do with what we had and set back out to meet up with our friends. After meeting up with them for dinner, we ended up spending the rest of the night out drinking, eating and wandering the city. 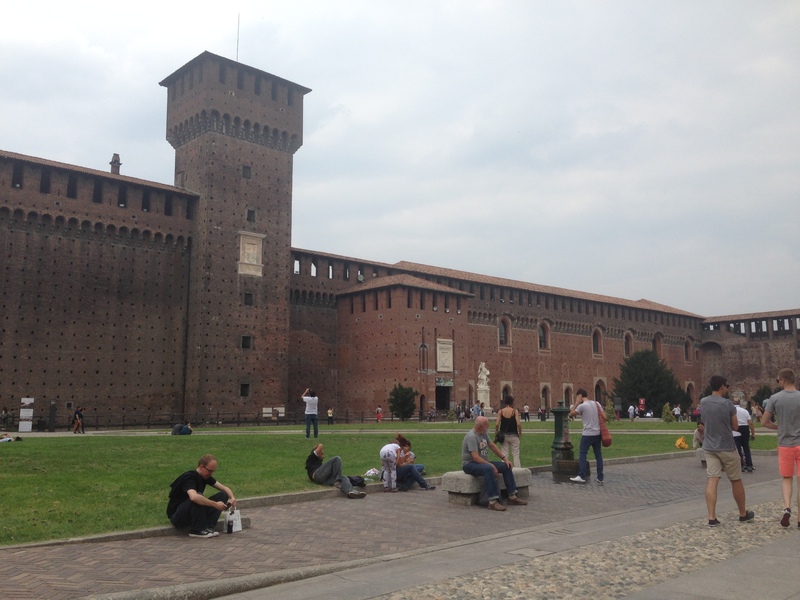 There happened to be a film festival on as part of the Milan Expo so we were able to sit down by the old Milan city walls and have a drink in the beautiful public gardens. It was lovely to sightsee with familiar faces from New Zealand and it was great to see them. After being away from home for awhile now, it’s always comical being told I am ‘sounding American.’ This was my biggest fear and it seems to be coming true! Good thing we have a trip back to New Zealand in a couple of months so I can work on building up the accent again for the long haul. There was one thing that I had wanted to see for a long time, but I didn’t think it would happen for me. As I mentioned in an earlier blog about Florence, I was an art history buff at high school. The study of art (not actually drawing or painting art, which I was terrible at) was a big favourite subject of mine and I was really good at it. I had always wanted to see The Last Supper, by Leonardo da Vinci, not for any religious reason but because I had studied it so much and I had heard it was quite magical. I still feel so thankful that I got to see Michelangelo’s David and Leonardo da Vinci’s Birth of Venus, so I really hoped since we were going to Milan that we would be able to see The Last Supper. As most of you know, I am a big planner. I plan most of our trips months in advance, some even a year in advance. I take great pride in the fact that I am able to get us into things that other people can’t go to due to my extreme planning. As we only booked this trip about a month out, I didn’t have the ability to plan this one out as well. There ended up being ONE tour left in all of Milan that included tickets to the Last Supper. It was ridiculously expensive and instead of just seeing The Last Supper we also had to walk around Milan for over three hours as part of a walking tour. The painting was incredible beautiful, stunning and magical. If you are ever in doubt about whether to drop the money on a tour so you can see it, just do it. Only 20 something people are allowed in the temperature-controlled room at any time and no photographs are allowed. The painting is in the Santa Maria delle Grazie, a church and a convent built 1463-1497. It was bombed during World War II, damaging most of the walls, but miraculously the wall that had The Last Supper painted on it survived. One thing that wasn’t able to be conveyed in all of the study I did was how the curves and framing of the mess hall actually becomes part of the painting. It jumps out at you – which is incredible for the period of the painting – it is over 500 years old! It was quite unbelievable on our tour of only eight people that one of the ladies that were on it happened to be someone that our friend goes to the gym with. She had happened to mention seeing her the day before (not knowing they were also in Milan) and low and behold the same lady ended up on our tour. New Zealand really is two degrees of separation – what were the odds that of all the tours that day that they were on the same one and just happened to be from Christchurch also. During the tour the skies opened and released downpour of rain. My feet got saturated and we had nowhere to escape to. I knew here to head to! Back to the airport to the huge mall so we could do more shopping. 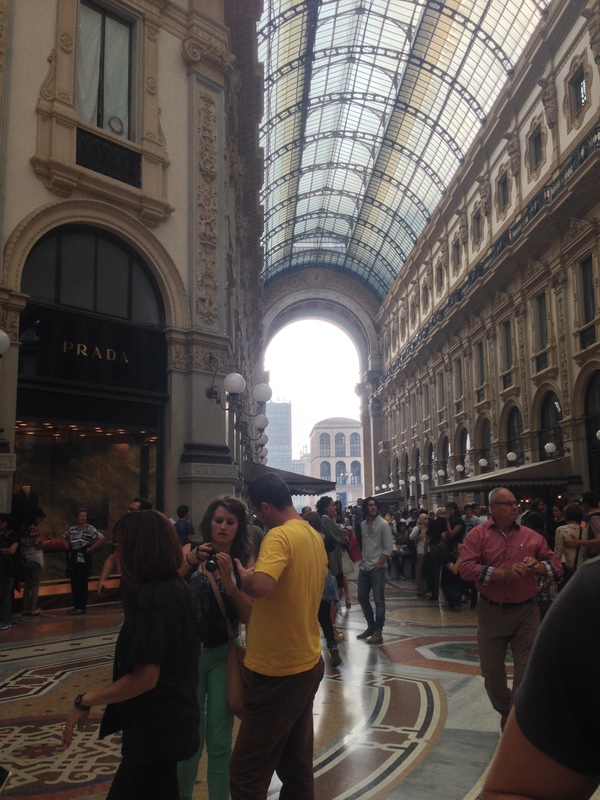 After all, we couldn’t afford Louis Vuitton but Milan is all about shopping so why not! We spent the rest of the day at the mall by the airport where Nick found the elusive pillow that they only seem to sell in Italy that he had grown fond of at our apartment the week before. Our flight left on time on Sunday night and we were back at Hahn about 15 minutes earlier than scheduled. How lucky are we to be able to jet off to a completely different city and country for the weekend!